I realize that I am treading on a Great American Obsession, but I confess I do not understand the lawn fixation that afflicts so many people. When was it decided that one’s home is inadequate if it is not surrounded by a meticulously maintained carpet of non-native grass? My cynical side wonders if this is another example of clever marketing. Certainly fertilizer and herbicide manufacturers, lawn-mower makers, and lawn-care companies would lose millions of dollars if Americans woke up one day and realized how many alternatives there are to artificially maintained monocrops in their yards. But I’m not feeling cynical today, not when my “lawn” is full of colorful botanical surprises. That’s just one of them in the photo above. 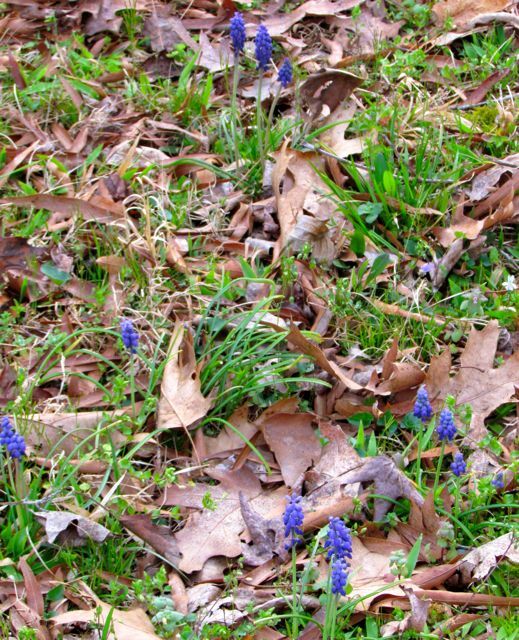 I’ve never planted Grape Hyacinths in my yard, but the previous property owner must have. Over the decades, the hyacinths have migrated from the old beds where they were planted into the green expanse that we mow occasionally and call our lawn. The hillside leading down to the floodplain is jam-packed with flowers at the moment. Lawn companies would call them weeds. I call them welcome soil-holders, because if they weren’t there, my hill would erode into the creek. Most of these flowers — speedwell, henbit, chickweed, mustard, buttercup, dandelion, violet, and Johnny Jump Up — were brought to this continent by European settlers. These plants were deemed such essential kitchen garden components that room was made for them on the long voyages to this land. Usually these plants served more than one purpose. In the spring, their young green leaves provided welcome nutrients to winter-starved bodies. Medicines were derived from some. And most folks have at least heard of dandelion wine. These plants, once deemed so essential to life by our ancestors, are now mostly shunned — at least by those obsessed with the quest for pristine lawns. But not by me. In my yard, these botanical lawn ornaments will always be welcome signals of spring’s return. This entry was posted on March 24, 2011, 8:33 am and is filed under piedmont gardening. You can follow any responses to this entry through RSS 2.0. You can leave a response, or trackback from your own site.